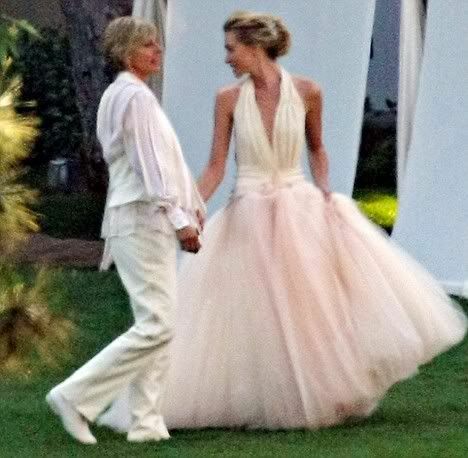 Chat show host Ellen DeGeneres and actress Portia de Rossi were married following an intimate ceremony in the grounds of their LA home. Fewer than 20 of the couple's family and friends gathered at sunset for the civil service ceremony. I'm really happy for them, but kind of surprised that they had only 20 people at the ceremony. 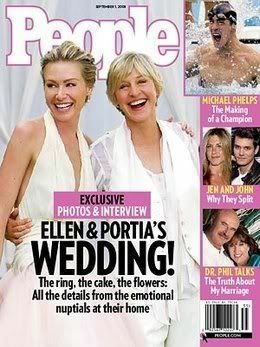 I mean, it's not like Scott Baio and Soliel Moon Frye got hitched....it's ELLEN. She's got a heapin' helpin' of celebrity friends and hangers-on...you'd think the wedding party alone would be over 20. Maybe they had a ginormous reception at Dodger Stadium. I'm sure the tabloids will poop out every intimate detail over the next few weeks.